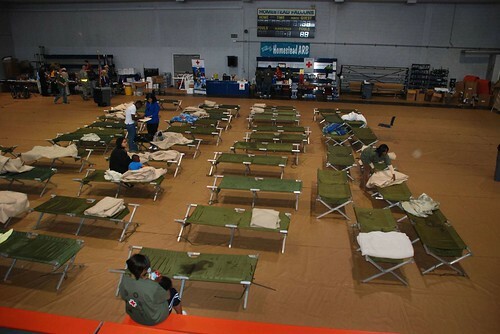 Since the earthquake in Haiti, American Red Cross support for Americans coming and going at Homestead Air Reserve Base in southern Florida just sort of snowballed. was to support airmen taking supplies and crew to Haiti. 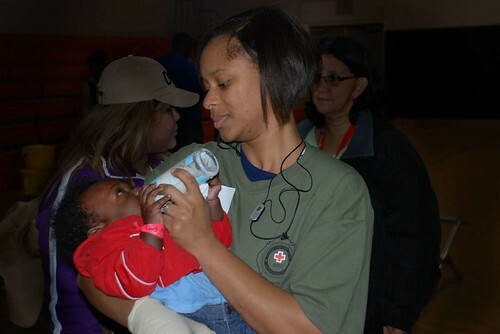 Prior to the quake, the Red Cross had a long history of providing service to armed forces at Homestead, so it was natural for the Miami Red Cross chapter to load up a panel truck, park it on base and pass out beverages, snacks, conversation and smiles to military personnel engaged in the Haiti operation. Less than a week after the quake, the Department of Defense and U.S. Customs converted a gymnasium into a processing center for repatriated Haitians returning to the United States. Repatriates arrive in unscheduled drips and drabs. Three people on one flight; sixty on the next. Several planes in a row and then six hours without arrivals. Some repatriates are brought in by private pilots. Most have secured empty seats on military cargo planes returning from Haiti. Once back in the United States, reentry is arduous. Repatriates deplane onto Air Force buses, which transport individuals to the processing center. At the center people line up for the hour-and-a-half wait to get through customs. When cleared for entry into the U.S., new arrivals are bused to the airport to catch planes to different parts of the country, or they wait for family members to pick them up at the front gates of Homestead Air Reserve Base. In making plans for the processing center operations, the government called on two organizations for help: the Florida Department of Children and Families; and the American Red Cross. The Greater Miami Red Cross chapter got another call from base officials to provide support to Haitian repatriates. Volunteers have staffed the makeshift customs office 24/7, with 12 volunteers to a shift. At the same time, the Red Cross continues support for aircrews. Chapter volunteers have provided support to thousands who have arrived at Homestead under Operation Unified Response, the U. S. military’s Haitian relief effort. More than 1,500 people have arrived from Haiti in just the last two days. People arrive from Haiti desperate, disoriented, thirsty and hungry. There are many infants, most without diapers, wipes, baby bottles, formula and baby food. Red Cross volunteers bring a human touch to the repatriation process. A heartwarming smile. A cup of coffee or hot chocolate. A snack. A teddy bear for a child. A full baby bottle and a clean diaper. Something as simple as pointing out the location of restrooms. The Red Cross is also providing volunteer translators to greet people in the most comforting way possible when they arrive. To underscore the compassion of the Dade County community, Davis tells about a gentleman who arrived with a five-month-old baby. His wife had been lost in the quake. Their home had been flattened. Nothing was left. The baby had filthy clothes, a filthy blanket. Davis made a telephone call for help. Within ten minutes the baby had six new outfits, two blankets, a huge package of diapers and a toy. The American Red Cross has a long-standing agreement with the federal government to support repatriation efforts when Americans need to be evacuated out of foreign countries because of conflict, natural disaster or other emergencies. The last time the American Red Cross participated in repatriation efforts was in 2006 when fighting broke out in Lebanon. The Red Cross met the flights when they arrived at the airport and provided passengers with food, blankets, toiletries and mental health support. The Red Cross is there to welcome repatriates home and be a shoulder to lean on. Many times repatriated citizens have seen traumatic things, been through very difficult experiences and may have left only with the clothes on their backs. As is the situation at Homestead Air Reserve Base, the Red Cross does all of this in support of Federal partners, who lead the repatriation efforts.